Save the restaurant, save the world. Okay, not really, but it feels that way to Arturo in The Epic Fail of Arturo Zamora by Pablo Cartaya. Since before Arturo was born, his family has run their restaurant La Cocina de la Isla. La Cocina is a special place in a close-knit Latino neighborhood. Arturo's abuela knows every regular customer by name and it's a place where many in the community feel like family. Now, it's being threatened by a developer who wants to move in and build condos and destroy their neighborhood. In addition to saving his restaurant, Arturo's trying to win over the girl of his dreams, his god-cousin Carmen who's come to visit for the summer after the death of her mom. She's into poetry and activism; how can Arturo get her attention? And he's starting his first kitchen job in the restaurant - not a prep chef like he'd imagined, but a dishwasher which is harder than it sounds! It's a lot for one thirteen-year-old boy. Can Arturo make it work? Or will it all be an Epic Fail? I don't know why I waited so long to pick up this book, but I'm so glad I did. It won a Pura Belpre honor, so that definitely tells you something. I fell in love with Arturo and his family and their neighborhood. This is a great story about the power of people to stand up to bigger, richer forces and defend their neighborhoods and their way of life. It introduces the concept of gentrification in a way that makes sense and really digs into the issues surrounding it. Arturo and the other kids in his family really take an active role, seeing the urgency in their situation even as others in his family want to pretend it's not happening to protect their ailing abuela from the devastating truth. It's funny and it's serious, which is my favorite kind of contemporary story. I like to laugh AND cry. I listened to the audiobook, which is read by the author and it's great. Pablo Cartaya is an actor, which makes sense since he reads really well and does voices for the characters. Audiobook is a great way to experience this book if you, like me, don't always know how the Spanish words should be pronounced. Or if you're just looking for a fun listen. This would be a great family listen for families with tweens, too. Hand this one to activism-minded kids or kids who like realistic stories about kids making a difference in their communities. An oldie but a goodie: Hoot by Carl Hiaasen about a kid trying to save the burrowing owls in his Florida home from development, this is another book for kids who want to save the world. The tone and characters of the book reminded me a lot of Gordon Korman, so maybe try Ungifted. And readers looking for stories about boys told with a mix of humor and serious subjects might like Ms. Bixby's Last Day by John David Anderson. For kids drawn to Arturo's experience in the kitchen and restaurant life, hand them All Four Stars by Tara Dairmen. For kids looking for more stories about Latino families, try Enchanted Air by Margarita Engel, Stef Soto Taco Queen by Jennifer Torres, or Lucky Broken Girl by Ruth Behar. 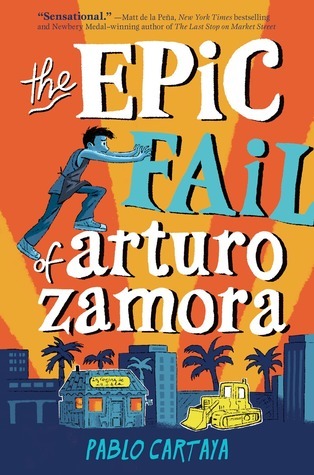 The Epic Fail of Arturo Zamora by Pablo Cartaya. Grades 5-9. Viking, 2017. 230 pages. Audiobook is 5 hours and 6 minutes. Review copy provided by my local library.